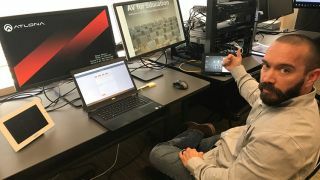 From driving 4K content to facilitating wireless collaboration, Atlona has spent more than a decade helping commercial and residential AV users connect. While Atlona is relatively smaller than veteran control and distribution manufacturers like Extron and Crestron, the company is doubling down on its R&D. The results of those efforts have come into focus this year with the advancement of three innovative product lines: the Velocity control platform, OmniStream AV over IP platform, and SW510W video switcher. This tech trifecta helps ease current pain points, but it is also forward-facing. Atlona sees the potential of leveraging IP as the industry migrates from point-to-point AV silos to more user-friendly, software-centric environments. Last week, I visited Atlona's headquarters in San Jose, California to test-drive Velocity. Here’s what I learned. Why program when you can configure? Save dollars and hours. David Shamir, director of Product Management at Atlona, told me that to create the AV control platform of the future, the engineering team looked to the past. The team examined the technical and business limitations of traditional AV control from the perspective of the integrator and in-house manager. What Shamir concluded was that the traditional approach—requiring significant programming acumen, time, and budget—is outdated. Most AV equipment needs to be upgraded every four to five years. As systems continue to expand to meet users’ ever-changing BYOD needs, refresh cycles must be streamlined. If a system can’t scale, it’s useless. Downtime is not an option. As the Atlona team created the recipe for an optimal AV control system, it became clear that the cloud and IP could be intelligently leveraged to deliver a “unified, easily scalable control architecture that offered remote capabilities and a consistent look and feel,” Shamir said. Atlona’s Velocity, the AV control platform for both Atlona and third-party products, proceeded to take shape. Covering the panoply of AV environments—from small huddle spaces to an enterprise with thousands of employees—Velocity was built to support agile and fast system configuration. Velocity integrates two unique elements that work together as a unified platform. The Velocity Cloud portal is a secured cloud-based service and centralized resource for integrators and in-house tech directors to create and manage AV control projects. The Velocity Control Gateway is an all-IP software-based control processor that lives on-site with the client’s AV systems. The on-premises gateway can be configured to communicate with the cloud component and be managed remotely. Instead of a control processor tied to fixed device control capacity, Velocity’s cloud-based service and centralized resource lets managers and integrators create AV control projects by specific client, client sites, and locations (e.g., Classroom One, First Floor). An integrator or manager can access the cloud service for remote monitoring via a web browser from any location. This model makes configuration fast and intuitive with the familiar interactions, flow, and visual GUI of a web or mobile app. The configurations can be replicated across IP-addressable devices, rooms, and sites, simplifying a complex or enterprise-wide deployment. While users can still use their own devices for BYOD integration, in an effort to offer a unified experience, Atlona has developed Power-over-Ethernet (PoE) Velocity Touch Panels for use with the Velocity suite. These models, Atlona’s first foray into branded touch panels, are available in 5.5-inch and 8-inch black and white bezels. A software license for the Gateway is also available for hosting on the IT server infrastructure, with the capability to serve up to 5,000 devices. It is not enough for a GUI to be web-based, Shamir explained. A graphical user interface must be supremely easy to operate, intuitively designed, and accessible for all users on touch panels as well as BYOD devices like iPhones, Android tablets, and laptops. On those points the Velocity delivers. Users or system integrators with no programming skills can design powerful graphical interfaces to control AV systems. Those user interfaces are downloadable from on-premises gateways by touch panels or users’ BYOD devices. The ability to duplicate an interface will help managers and installers create a more standardized, consistent look and feel from room to room or site to site. No one wants to relearn how to fire up a projector via control interface from one floor to the next in a university setting. Leveraging IP and the cloud also will help tech managers visualize the overall performance of their AV systems. This includes the need for centralized monitoring access, AV usage data, emergency notifications, and analytics across multiple clients and sites. Going beyond the notion of a dashboard, the analytics help managers understand what is used, how much, how often, and when. Velocity is recording data constantly, and “the cloud integration makes analytics lightning fast,” Shamir said. Velocity is a significant advancement for Altona, but the team is also excited about the November ship date for its SW510W video switcher. Apples to apples, the SW510W stands up to the spec sheets of well-known switchers and BYOD hubs like Barco’s ClickShare. This protean system offers enhancements including DisplayPort, native wireless integration, and USB-C. Not only does USB-C let users instantly join a real-time collaboration, it can also power a BYOD device. The SW510W is compatible with AirPlay, Miracast, and Google Chromecast, and its native wireless integration supports streaming right to the box. There is no need to download additional drivers before a class or meeting; it is software-free. If you can operate your phone or laptop, you’re ready to share and present. SW510W takes connectivity even further with mirrored HDMI and HDBaseT outputs. It also has the capability to integrate sensors for motion activation of the unit, and audio de-embedding is baked right in. If your IT department wants to bring it onto their own network, they can. It can serve double duty as a Wireless Access Point if needed. For content security, managers can configure static passwords or select dynamic place-based passwords such as setting a password for a specific classroom. The SW510W was designed to be an inviting, reliable switcher for collaborative spaces with a diversity of users: classrooms, lecture halls, training rooms, briefing centers, and presentation environments. At press time, the shipping date for the Atlona Velocity is October 10, 2017. SW510W shipping is slated for mid-November. All Atlona products carry a 10-year warranty. The Atlona Academy offers Velocity training classes and OmniStream certification courses. The company is also doing live courses at its San Jose headquarters and on US roadshows. Learn more and sign up for a product demo via http://www.atlona.com/velocity.